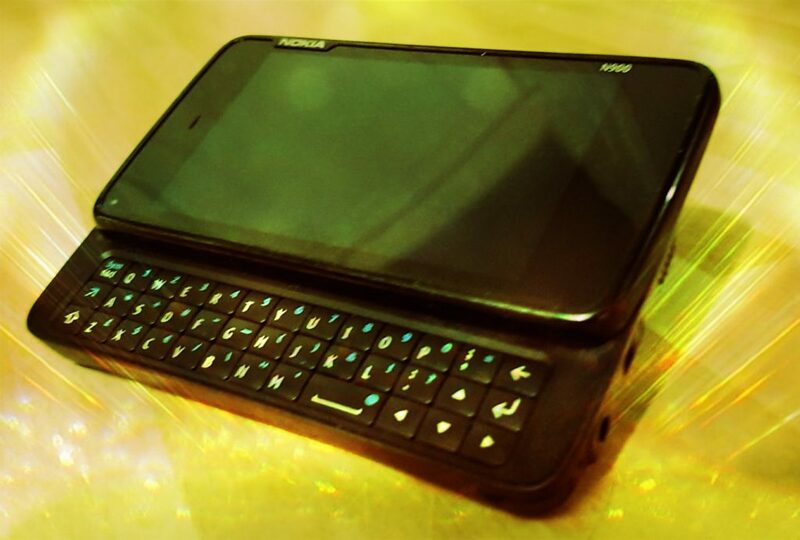 The N900 is still by far my favorite of all the phones I ever owned, and it was so for three main reasons. Number one: The slide-out keyboard. When I had that keyboard, the best email-interface was still just Mutt over a terminal. Which is to say, the best and most efficient email-interface ever! A single blind thumb-twitch to do any action at all. You could use Vim! It actually made sense to use Vim. Without looking! You could type without looking! If I really needed to I could even use it to write code, though I never tried very hard coz it was still damned frustrating and proper keyboards are usually fairly nearby when it comes to thinking of spending hours on a task. It was way better than a touch-screen for shelling in and fixing server issues when you’re stuck at a party away from keyboard. I’ve done it with a touch-screen, and even hacker-keyboard isn’t close to that physical-thumboard. Actual code writing tends to mean using lots of symbols, and while the N900 keyboard was better than a touch screen, both make you want to rip open your skull and put the wires in directly in frustration. I could and did use it to write and edit long-form prose. Modern screen-keyboards are no way to edit a novel! Touch-screens are absolutely rubbish for text-input, and even good voice-dictation rubbish for text-editing. I miss that keyboard so much. I own a similarly sized Bluetooth keyboard now, but never seem to have it with me coz it’s not attached, and has no way to attach. That phone had the best microphone out of any phone-mic I’ve ever owned by a clear mile too. Certainly the only one that could stand up to being used in the band practice-room without just distorting to hell coz of the volume. I still use it for that now and then, for video-recording band-practise, cos nothing else ever came close. The USB port broke and now I can only transfer files with WI-FI and have to use an external battery charger. All my batteries are swelling slightly and really ought to be retired before they burn my flat down. But I don’t have anything else that will actually work for that task. In particular, it’s operating system’s freeness and open sourciness and unixitude and native-bash! It ran on a full Gnu/Linux system, with Bash and all the Gnu Tools and an X-11 server and all the free software goodness you could ever want. Anyway, put me down as demanding a phone with a slide-out keyboard, a free-software based OS and an excellent microphone that won’t distort under extreme volumes. Trouble is, these days it’ll also need an equivalent compatible to Daydream VR, a E-Reader that actual books can be ordered from (ideally without Amazon, but needing at least all Amzaon’s content), and some kind of Chromecast-a-like, plus access to the best geo-mapping available and Netflix-or-better. Which means it’s unlikely to be the Plasma-Mobile, KDE-based indy phone OS ( https://plasma-mobile.org/ ). Much as that fact makes me sad, because I really miss all those features and I find I’m regressing on the open/free software front quite badly. I even have Windows in my life again now for VR reasons, despite it being Microsoft’s damned fault that Nokia’s N900 system died. It even had a built-in kick-stand FFS!